Almost three years after Malaysia Airlines Flight MH370 disappeared from civilian radar screens, the search for the missing aircraft has come to a close. Malaysia, Australia and China have jointly agreed to “suspend” the search after combing 120,000 km² of the southern Atlantic Ocean without finding the crash site. So what now for the hunt for MH370? Could the wreck of the Boeing 777-200 be somewhere outside the search zone? Could parts of the plane that washed up in the western Indian Ocean give clues to where it might have crashed? Was the search in vain? Initially the search region was in the South China Sea. But on March 24, 2014, it was revealed that the plane most likely crashed in the southern Indian Ocean along a line defined as the 7th arc, based on satellite data from Inmarsat. Analysis of a series of seven “pings”, originating from the aircraft engines, indicated the likely location of the plane. Each ping allowed analysts to draw an arc that showed the likely path of the aircraft. 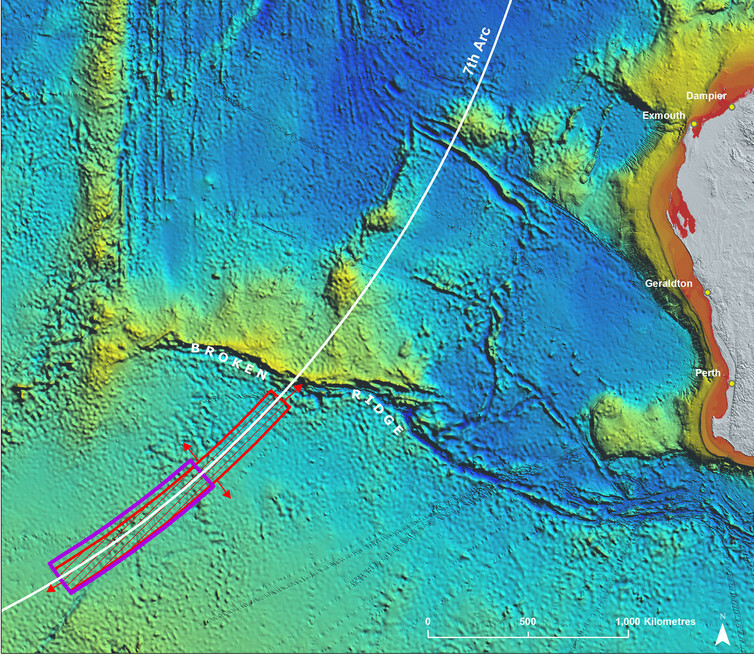 The Australian Transport Safety Bureau (ATSB), which led the search, identified the most likely region of the crash as being the southern section of the 7th arc, corresponding to the final ping received from MH370. Based on the the Inmarsat data and flight simulations, the ATSB defined a detailed search area of the sea floor within 40 nautical miles of the southern segment (39.3°-36°S) encompassing an area of 120,000km². Location of the 7th arc and the main search regions. In addition to the Inmarsat data, other evidence for the search area was provided by the discovery of aircraft debris that washed up on the shores of countries of the western Indian Ocean, including Reunion Island, Madagascar, Mozambique, South Africa, Tanzania and Mauritius. Oceanographic drift modelling has indicated that these discoveries were consistent with the debris originating from the region of the current search area. But considering the time the debris took to travel to the western Indian Ocean, it was proposed that the most likely origin of the debris was to the north of the search area. These findings were confirmed by recent CSIRO drift modelling as part of an ATSB first principles review, as well by other international research groups. The ATSB review concluded that the crash site was “unlikely” to be in the defined search area and recommended extending the search to an additional area of approximately 25,000km² located to the north. It should be noted that the original 120,000km² search area was defined before any debris was discovered in the western Indian Ocean. Thus this did not take into account the oceanographic evidence. 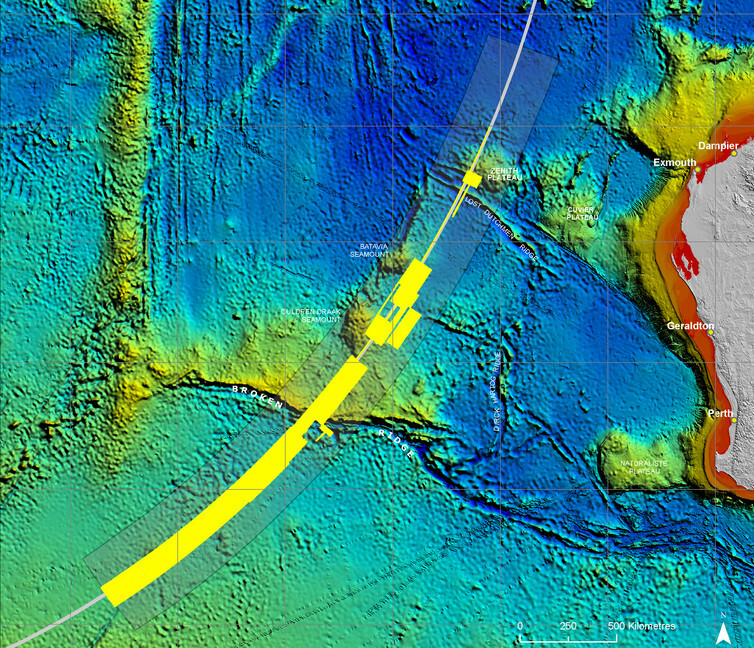 The proposed additional 25,000km² search area (in black) identified as the most likely crash region. 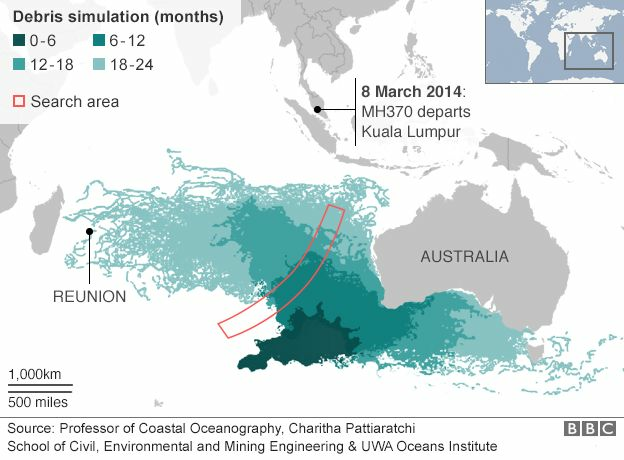 The oceanographic drift modelling allowed for identification of particular regions in the western Indian Ocean that the debris from MH370 would make landfall. These predictions facilitated the discovery of many pieces of debris by US lawyer and amateur investigator Blaine Gibson in Mozambique and Madagascar. 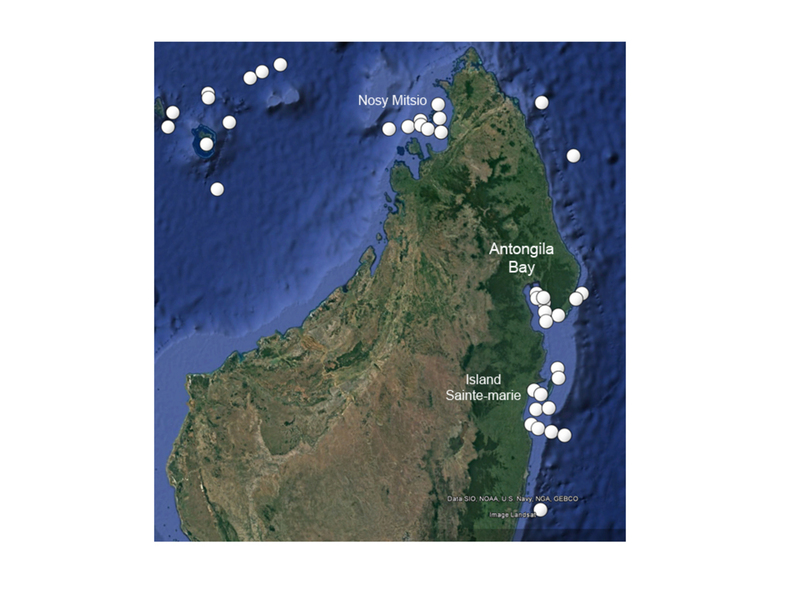 Recently, possible debris maps provided to Gibson and next-of-kin of crash victims discovered additional debris in Antongila Bay, Madagascar. Predicted landfall sites of particles tracked from the oceanographic drift modelling. White dots represent the areas where aircraft debris represented by particles beached. More than one particle in a region location means higher likelihood of finding debris. Blaine Gibson found many pieces of debris at Raike Beach on the Island of Sainte-Marie and in Antongila Bay last November. The group also visited Nosy Mitsio but reported that the shoreline was very rocky and not able to retain any debris. The model resolution does not take into account the shoreline type. This means the most likely crash site was to the north, most likely between 36°S and 32°S. The ATSB first principles review acknowledged this to be consistent with all the available information. Some of this area was searched but only within 25 nautical miles either side of the 7th Arc (not the 40 nautical miles searched before). It is highly likely that the crash site of the MH370 is located in this region. If another search was to be conducted, this is where it could start. Even though MH370 was not found in the search area, some useful information was gleaned from the process. 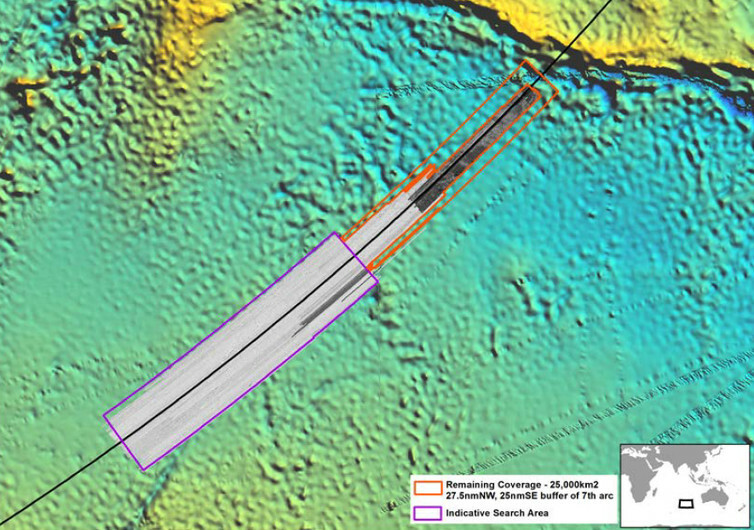 The intensive underwater search for MH370 was undertaken using tethered underwater vehicles in a region with limited information on the sea floor, which included complex terrain such as Broken Ridge. It was necessary to obtain detailed information on the sea floor to ensure the search was undertaken safely and effectively. Survey vessels obtained high-resolution bottom topography data not only along the 120,000km² intensive search region but also regions to the north. Map of the regions where high-resolution bottom topography data were collected. The data revealed many seabed features that were previously unknown. The high-resolution bottom topography, which will soon be made public, will contribute to new research, particularly on marine geology and fishery resources. Improved bottom topography data will also contribute to increased accuracy in oceanographic modelling and in the propagation of tsunami signals. So, while the search for MH370 may not have uncovered the wreck, it has contributed to our knowledge of a very remote part of the world. BBC : Is it likely that MH370 will ever be found?